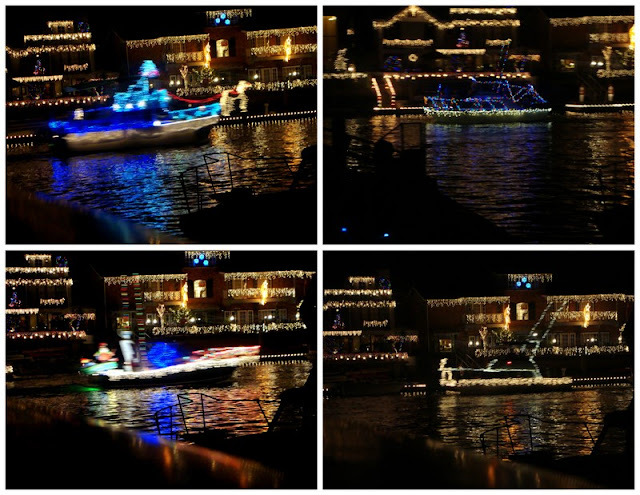 On Sunday night, we headed to Uncle Bill and Aunt Becky's house for the boat parade. The evening started with a little spin around the harbor in the BATMOBILE! We were informed by Aunt Becky that Uncle Bill is a bit of a boat whore with his Batmobile. Apparently, he likes to drive it up real close to parties and get everyone to look at him. We did get A LOT of looks while we were out and about. Later in the evening, we watched the parade from their backyard. We ended the evening with hot chocolate and a trip around the harbor in the duffy to see all the Christmas lights. I love this family tradition!